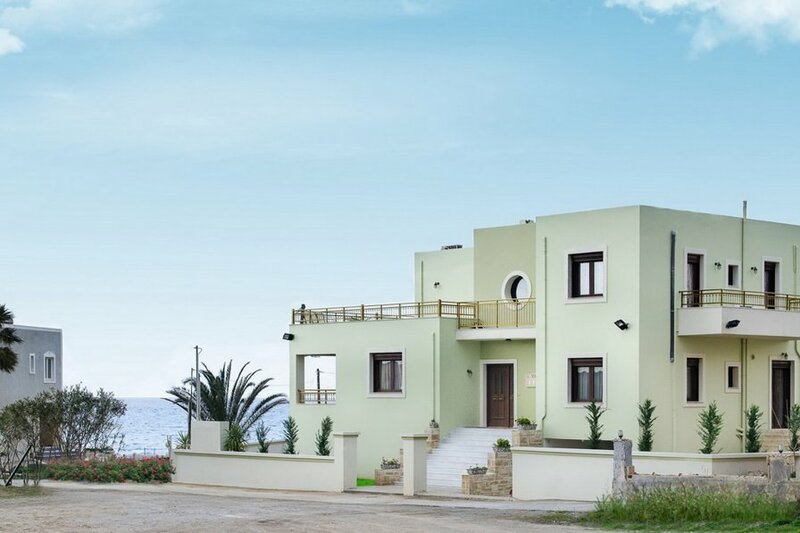 Villa Irene is a beautiful, impressive, five bedroom villa, located 10 km east of Rethymno in the beach area of Sfakaki. The villa is just 50 meters from the beach and sea which can be reached from a private path . The villa is surrounded by a 250 sqm garden with grass , ideal for kids to play and full of colorful flowers .The pool has a size of 40 sqm with sun beds and umbrellas around. Next to the pool there is a covered area , with patio furniture and a portable barbecue. It has a size of 300 sqm and has a 2 floors layout. Entering the villa on the ground floor (which has a size of 120 sqm) there is a large living - dining area (air-conditioned) with a fireplace , connected with an open plan fully equipped kitchen. Furthermore there are a bedroom with a double bed and a w/c. French doors lead from the dining - living area to a 40 sqm veranda , with patio furniture , just above the pool area and with view to the sea. This veranda is connected with the pool area with an external stone built staircase. An internal staircase leads on the upper floor where are four more bedrooms, three with two single beds each sharing a large bath/wc. The fourth is the master bedroom, which has a double bed and en suite facilities , bath/wc. In this floor there is a nice 60 sqm terrace with views to the surrounding area and the sea as well as a smaller balcony. All bedrooms are air-conditioned. A covered parking area is also provided suitable for 2 cars. The location is ideal as there is a Mini Market and Traditional Cretan Tavern next door also in a distance of 150 meters a variety of shops in the neighbor village of Stavromenos.